Many of us are constantly moving to get everything done, with very little time to ourselves. We feel hurried, frenzied, stressed and ultimately exhausted from all the things we need to do. This is a learned behavior handed down by generations before us. At home and at work, we have been taught that those who do “the most” or “work longer” somehow are “better” than those who do not do the same thing. We have essentially learned we are not “good enough” if we aren’t exhausting ourselves in accomplishing…well what? What exactly are we supposed to be accomplishing according to everyone else? What are others telling us that we must do to achieve some status? More importantly, how do we feel about it? How do we know how we feel about it when we are constantly on the go? Perhaps it’s time to slow down with no excuses or explanations. The energy of what society, family, work and friends tell us we must do is very agitating type of energy. It’s time to get grounded. It’s time to nearly stop, find the balance you need and recalibrate your life. That’s right…YOUR Life. What do you feel would be better for you? What’s your heart’s desire? What brings you peace? 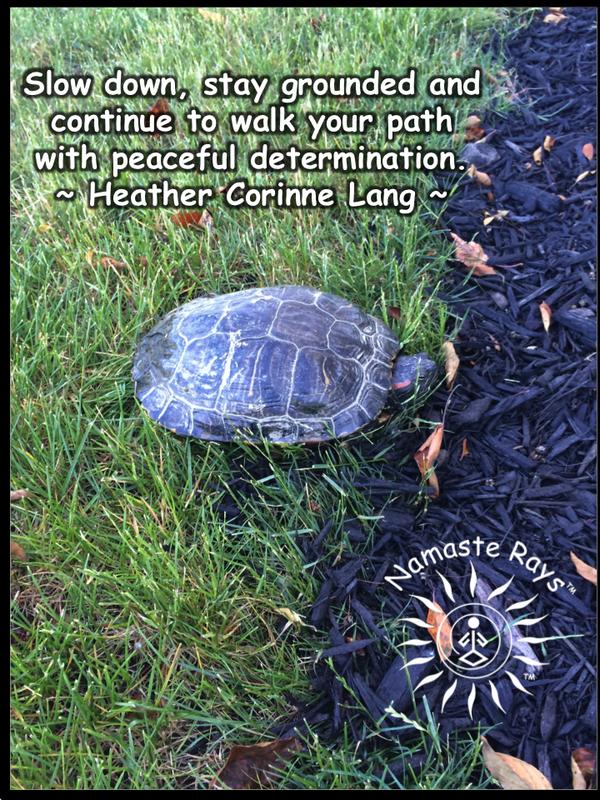 Slow down, stay grounded and continue to walk your path with peaceful determination. Everything does not have to get done. It’s time to determine what’s most important to you. Slowing down allows us to listen to our heart, hear our desires and move towards them. Slowing down helps to ground us. Grounding brings us more peace. The energy calms down. This helps us to see more clearly. The path lights up. We recognize the path and with determination, can move forward towards our dreams. We are then able to open up to our own understanding & wisdom. We gain emotional strength to do what we truly wish to do. Growing up in basically a middle class family, I did what I was taught. Go to school, work, go to college, work. I followed the path I was told would make me prosperous. And one day I began yoga, and found my inner thoughts. I grounded, I became more balanced, more thoughtful. I began questioning the status quo. I slowed way down. I found my peace. I found my inner truth. I became a Reiki Master, which opened up channels in me I didn’t know I had always had. I became more intuitive, more psychic and understood myself better. During this time, I met some of the wonderful people in my life I now call friends who helped me. Some of us formed a group where we heal each other, support each other, and are working towards our own special healing. Our first healing clinic is tomorrow. We are so excited! We have all worked towards slowing down, staying grounded, and walking our path with determination, peacefully and joyfully! Do I fall back once in awhile? Sure…for we do still have 3D energies at play (which I won’t go into now…but if you are interested, please let me know and I’ll write about it) as we move towards a new 5D energy which is loving, joyful and brilliant! We knew we had to do this, and we’ve been working towards it with complete and total trust in our path. You, too, can do it! Let go of what you no longer want, detach from it, and walk your path! Slowly at first, and then watch how it all manifests exactly how it’s meant to for you. May you slow down, ground, and walk your path! Greatly appreciate it, Divine Soul! Blessings of Love & Light! That’s wonderful and so true!! !